This hob grate is very finely cast and is in excellent condition. Weight 35 kg. This hob grate is very finely cast and is in excellent condition. Weight 37 kg. Georgian cast iron ‘Carron’ hob grate. Measures: Height 53.5 cm, 65 cm Weight: 40 kg. This hob grate has been professionally extended to create a larger burning area. This hob grate is in excellent condition. Weight 41 kg. 18th-19th century English Georgian fire grate made of wrought iron. Ornate antique William IV 19th century cast iron hob grate in the Rococo manner. Finished with traditional black grate polish to leave a gun metal finish. In original cast iron antique Georgian Hob Grate insert, with lion masks to the capitols and a central stylised flower, English, circa 1830. A large and notable antique Georgian cast iron Hob Grate, showing good quality casting, English, circa 1820. 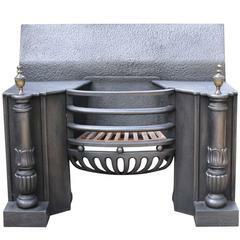 18th Century English Georgian Fireplace Grate or Fire Basket. 18th century English Georgian fire grate made of wrought iron. The grate is beautifully forged. The total width of the front of the fire grate is 32 inch (81 cm).